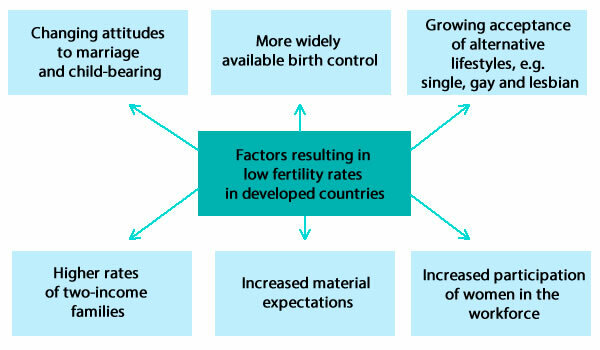 High fertility rates are generally found in less developed countries, however this is changing as a result of increased economic development and family planning initiatives being implemented. 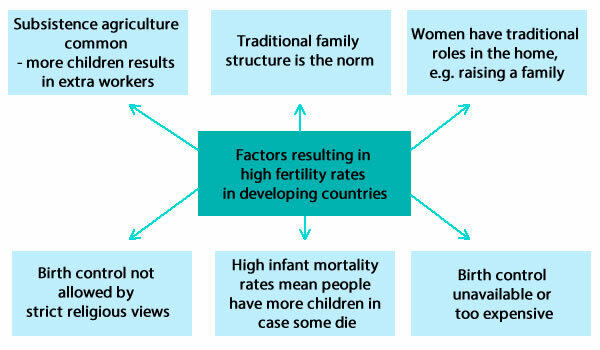 Factors contributing to high rates of fertility include the family structure (women in the tole of home-maker, stay at home mum), the structure of the economy (high proportion of agriculture), limited access to birth control (costly, not allowed by religious groups, or not available), and high infant mortality rates (people have more children in case they lose some of their children to disease, etc). 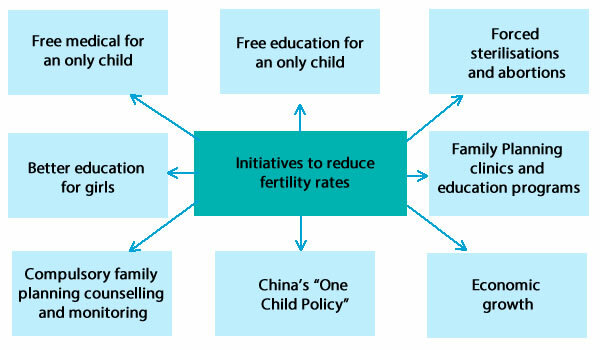 Countries have introduced a range of responses to try to reduce fertility. These include forced sterilisations and abortions, incentives to encourage smaller families (free medical and education), Singapore's "Stop at Two" policy and China's "One Child Policy". Improving the education standards of girls also reduces fertility rates, as these girls become women who want to play a part in the workforce, understand reproduction and fertility and want to acquire material goods and wealth. In many developed countries fertility rates have fallen below replacement level. The main issue associated with this decline is economic development. This includes higher rates of two income families, increased material expectations, increased participation of women in the workforce and in management roles, changing attitudes to marriage and child-bearing, more widely available birth control and acceptance of alternative lifestyles, e.g. single, gay and lesbian. 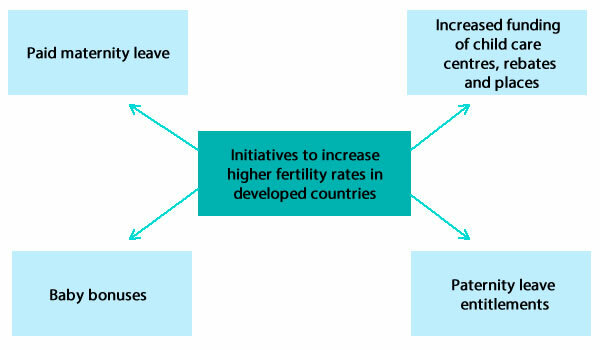 Attempts to improve fertility in developed countries include paid maternity leave, baby bonuses, provision of extra places in child care, paternity leave entitlements.